Early in the morning we awoke to an electrical storm and heavy rains. The rains continued throughout the morning so we decided that to stay onboard the ship instead of taking the shuttle into town and traipse around the city in the rain. By the afternoon the rain had subsided but it was still quite windy with intermittent light showers. 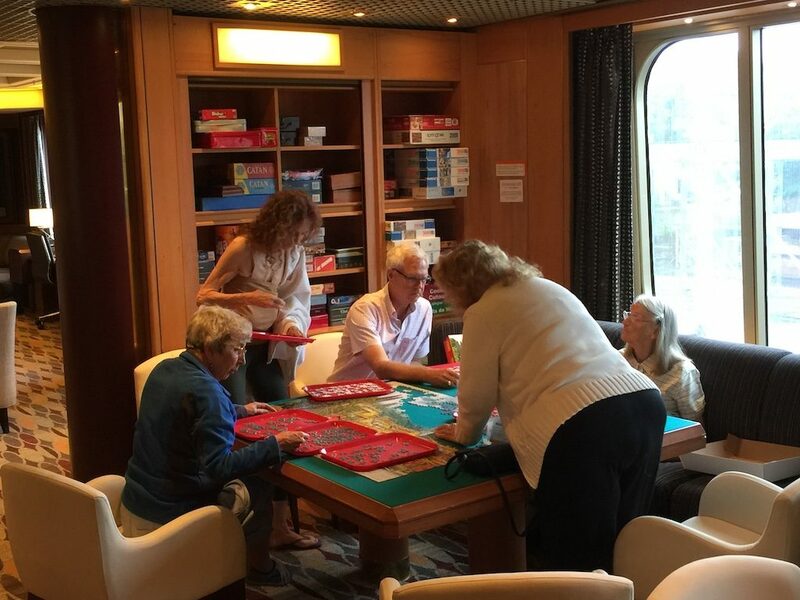 Onboard Mark worked on the community jigsaw puzzle of 2,000 pieces with several of the ladies onboard. Kent read his daily newspapers and spent time visiting with other guests. There were rumors of a suicide on board, but we can’t find anyone who really knows anything about it…..perhaps it is just a rumor. Even when you speak to people in authority on the ship you get varying facts about things that take place on the ship. After the sail away party, we sailed in late afternoon and as soon as we reached the open waters of the ocean the ship, began to rock and roll. The seas were very rough and the ship quickly put out the green apples at the front desk and placed barf bags at the elevators. Many people stayed in their cabins to avoid trying to navigate the ship. The scheduled entertainment was postponed and replaced with a movie.